Clinical Demonstration 03 from the Evolution of Psychotherapy 2005 - Brief Rational Emotive Behavior Therapy Featuring Albert Ellis, PhD. Clinical Demonstration 04 from the Evolution of Psychotherapy 2005 - Redecision Therapy: A Brief Demonstration of Change Featuring Mary Goulding, MSW. Clinical Demonstration 05 from the Evolution of Psychotherapy 2005 - Behavioral Chain Analysis of Dysfunctional Behavior Featuring Marsha Linehan, PhD. Clinical Demonstration 06 from the Evolution of Psychotherapy 2005 - Supervision of a Few Difficult Cases Featuring Arnold Lazarus, PhD. Clinical Demonstration 07 from the Evolution of Psychotherapy 2005 - Advances in Strategic Therapy Featuring Cloe Madanes; with co-faculty Anthony Robbins. Clinical Demonstration 08 from the Evolution of Psychotherapy 2005 - Clinical Supervision Featuring David Barlow, PhD. Clinical Demonstration 09 from the Evolution of Psychotherapy 2005 - The Union of Humanity and Technique Featuring Erving Polster, PhD. 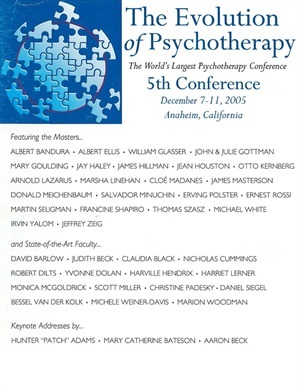 Clinical Demonstration 10 from the Evolution of Psychotherapy 2005 - The Imago Dialogue Process Featuring Harville Hendrix, PhD.